Creating strong learning cultures in schools using documentation as a tool to deepen and extend learning. 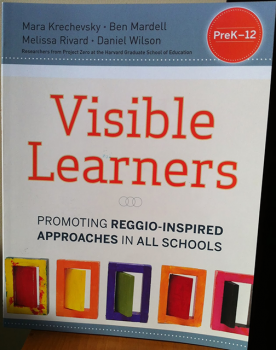 Making Learning Visible has a goal to create and sustain powerful cultures of learning in classrooms and across schools that nurture individual and group learning. Though the project focuses on using documentation as a central pillar of group learning, MLV is ultimately a project about democracy. By learning in groups, we also learn about the cultures and values of others. By seeing how these unique perspectives influence the learning process, we gain a greater understanding of what we learn as well as each other. This book reports on a collaboration between Project Zero and the Municipal Preschools and Infant-toddler Centers of Reggio Emilia, Italy, on the nature of learning in groups and how to understand, support, document, and assess individual and group learning. The authors argue that systematic and purposeful documentation of the ways in which groups develop ideas, theories, and understandings is fundamental to the meta-cognitive activity that is critical to the learning of individuals as well as groups. The Wheelock Documentation Studio: The Wheelock Documentation Studio is a space for educators to learn about, develop, and exhibit documentation from a variety of learning contexts. The Boston Public Schools Early Childhood Making Learning Visible Weebly: This site includes videos, documentation examples, and other resources related to MLV practices in early childhood classrooms. Reggio Children: International Center for the Defense and Promotion of the Rights and Potentials of All Children – is a mixed public-private company established in 1994 on the initiative of Loris Malaguzzi and a group of local citizens. Reggio Children’s mission is to carry out experimental research and to promote and disseminate high quality education worldwide. Reggio Children also manages the educational and cultural exchange initiatives between the municipal early childhood institutions of Reggio Emilia and educators and researchers from around the world. Documentation collected for this purpose helps teachers stay close to students' learning and interests by enabling them to revisit a learning experience. It leads teachers to compare what they thought would happen to what really went on and informs decisions about where to go next. Sharing this kind of documentation with others reduces the subjectivity of a single person's analysis and interpretation and can deepen understanding. This form of documentation is the least shaped (or the most "raw") of the three types described here. Reviewing this type of documentation often influences the amount of time a group spends on a topic and the level of student involvement in shaping the learning experience. 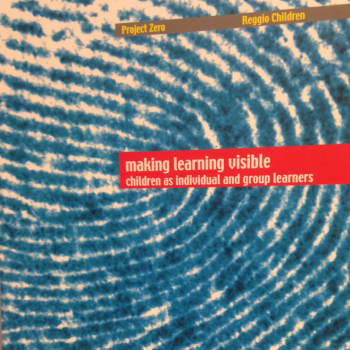 Making visible images of learning and being together in a group is a way to foster group identity and learning. This type of documentation promotes conversation or deepens understanding about one or more aspects of a learning experience. It can serve as a memory of learning in the classroom, allowing children and adults to reflect on, evaluate, and build on their previous work and ideas. Sharing documentation back with learners can take many forms: a photocopied sheet of paper, words repeated back to students, work brought back to a small group or put up on a wall, or a carefully arranged panel. The examples in this section range from more immediate and "in the moment" to more fully framed and shaped. Documentation is an act of communication; it makes public a conversation about what we value. When preparing documentation to stand on its own, documenters need to provide enough context and framing so that others can derive meaning from it. Depending on the purposes and setting for the documentation, the context could include logistical information, such as key names, dates, and age group represented, as well as the purpose of the learning experience. Documentation: When does it Make Learning Visible? Documentation and Display: What's the Difference?